As smartphone manufacturers attempt to squeeze larger displays into devices that remain small enough to still be usable one-handed, a number of different approaches have emerged to deal with the selfie cameras, speakers, proximity and light sensors, facial recognition system, and anything else that prevents the front of devices being entirely dominated by a display. Apple, OnePlus, Google, Essential and Huawei have all opted for the notch – a curved cut-out at the top of the display to house the camera, speakers, sensors and the like. Meanwhile, Xiaomi has opted to remove these elements from around the front of the handset entirely, bundling them into a sliding drawer that’s revealed by pulling down on the screen, like the sliding keyboards on Nokia phones of years gone by. Samsung, which has openly mocked the idea of a notch, has teased plans to launch a dual-screen handset that will offer more screen real estate in a pocket-sized package thanks to a pliable 7.3-inch OLED that opens like a paperback. But there is a new approach on the horizon. And it’s very intriguing. Instead of trying to squeeze its selfie camera into a notch, cutting a pinhole in the screen for the lens, or engineering a sliding mechanism, Nubia has decided to ditch the troublesome tech from its next handset altogether. In its place, Nubia wants smartphone owners to use the rear-mounted camera to shoot their selfies. To make this easier, the latest handset from the company has a secondary display on the back of the device. The screen is calibrated to match the coating on the back of the handset, so it blends perfectly. 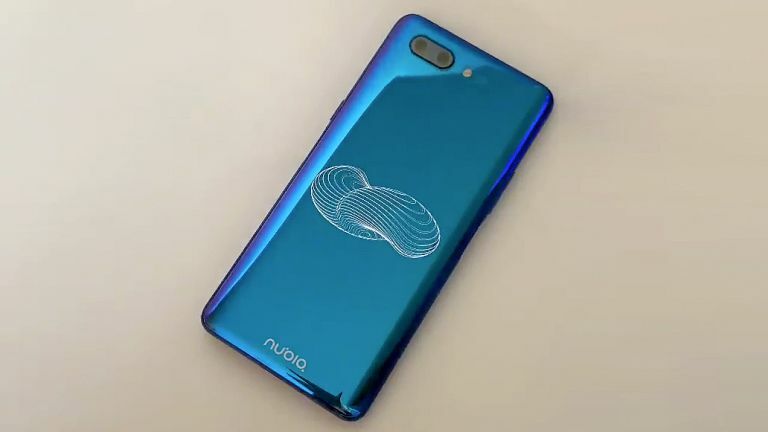 Serial tipster known as Ice Universe, who is renown for posting accurate information, photographs and videos of an as-yet-unannounced device, shared a video of the dual-screen smartphone, known as the Nubia X. In the footage, the secondary 5.1-inch OLED screen is set to a screensaver-like mode that plays a memorising animation, whilst keeping the majority of the screen blended with the colour of the case. When you want to take a selfie, the rear-mounted display will wake-up and display a real-time view of what the camera sees – so you can line-up your selfie perfectly. It’s an interesting solution to one of the biggest issues with all-screen designs, and the Nubia looks undeniably cool. However, those who prefer to keep cases on their smartphones likely won’t be overjoyed by the new feature, and those who don’t bother with any kind of protection run the risk of smashing two screens instead of just one, the next time the phone accidentally slips from their hands. There’s no word on a worldwide release date yet. Stay tuned for more information on this intriguing new handset as we learn more. Posted in Blog, Tech Corner and tagged #2019, #announcement, #apple, #blackfriday, #breach, #cheap, #christmas, #cybermonday, #data, #facebook, #Galaxy, #galaxyS10, #gaming, #google, #Graphics, #hacked, #hacker, #Hackers, #Huawei, #mcsc, #messiah, #News, #newworld, #Nubia, #nubiaX, #oled, #Oneplus, #paperback, #passengers, #present, #presents, #S10, #samsung, #security, #smartphones, #tech, #TheMessiah, #WASHINGTON, #whatsApp, #Xiaomi, Anonymous, messiahcybersecurityandconsultancy.